Digital Ground—D GND supplies the reference for port 0, port 1, port 2 digital channels, PFI, and +5 V. When D GND is listed with a number, it is the dedicated ground reference for that PFI signal. All ground references—AO GND and D GND—are connected on the device. 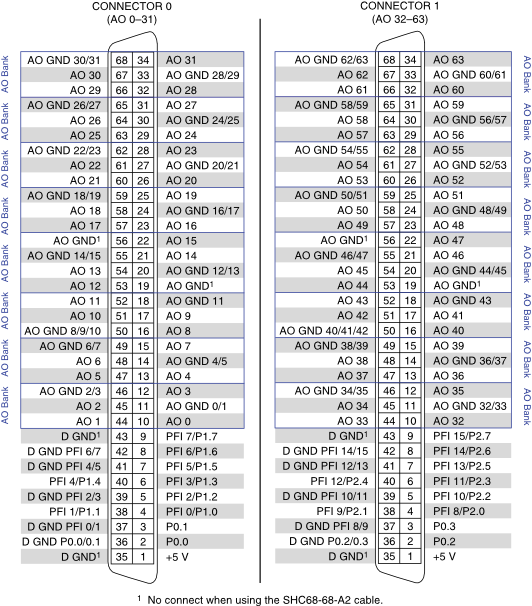 Though AO GND and D GND are connected on the device, they are connected by small traces to reduce crosstalk between subsystems. Each ground may have a slight difference in potential. As an input, each PFI terminal can be used to supply an external source for AO, DI, and DO timing signals or counter/timer inputs. As a PFI output, you can route many different internal AO, DI, or DO timing signals to each PFI terminal. You can also route the counter/timer outputs to each PFI terminal. As a port 1 or port 2 digital I/O signal, you can individually configure each signal as an input or output.